Again, so sorry for the delay in getting this up. Sometimes life takes precedence over spreadsheets, yanno? image as" to use in your blog/journal. One of the things I love about Thanksgiving were the traditions in my family. On my dad's side of the family, my recollection is that every Easter we played Whiffle Ball, but every Thanksgiving we played basketball and then Trivial Pursuit or Charades. And while the dinner was amazing, the focus was mainly on dessert and the variation of pies that people brought. I think once we had 26 people and 21 different pies. My dad was known for his apple and mincemeat pies, grandma had dibs on the cherry pie making, and then there were the additions of Irish Whiskey (Cream) Pie and Gobble Pie as kids got older and family members were added. On my mom's side of the family, a normal routine took on extra special meaning because of the day and the number of family members around the table. We'd all say what we were thankful for. Some people were profound (being thankful for health and love) and some people were a bit more mundane (my brother was usually thankful for forks). My (second) cousin on that side issued a challenge to her Facebook friends to do a gratitude project during this month, and I'm going to follow suit. My time in the gym is always a time of work but also of introspection. I'm deeply grateful for each day my body gives me to move and change my life. 2. Fill out the next available line on the "Summary" spreadsheet (do not use Columns F or G, J or K -- they will automatically calculate once link your sheet). 3. **CREATE YOUR INDIVIDUAL PAGE** (This is a NEW step. Duplicate the "Participant Sheet." If you're comfortable working in spreadsheets you can edit it where it should repeat your personal information. The formula line will look something like "=Summary!A2" -- replace the 2 with whatever line you are on the summary spreadsheet. For =Summary!B2 do the same, etc.). 5. Fill out the sheet as you wish. I'm also quite happy to see how #GoTheDist and #MeFirst can work hand-in-hand. Consider taking the #MeFirst pledge! 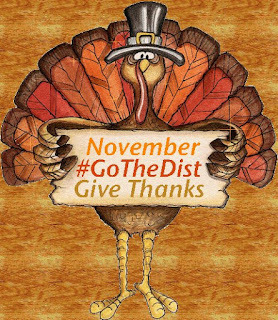 So grab your #GoTheDist buttons, use the hash tags for each month, and get out there! We're all behind you! How do you think you did over the course of the month? Did you overestimate or underestimate your capabilities? Why is this? Is this representative of a larger trend in your life? Did you learn anything about yourself while doing this? Can you apply what you've learned in #GoTheDist somewhere else in your life? Did you make any new friends through #GoTheDist -- were you able to support each other? No matter the numbers you already entered, are you going to finish strong, or taper off? Did you go the distance? And no, I don't mean did you hit 100% of your goal... did you put yourself out there and really try for it? Is 80% still something you can be proud of? So close!! But do you feel good about your intentions?